Pre-heat oven to 230 C and place a large pan of water on the hob to boil . Line a baking tray with greaseproof paper. Dip each end of the Ingham's chipees into the beaten egg and place the almond on the end as the witche's fingernail, continue until all have a fingernail! Notes... If you want the witches fingers to look fat and swollen, go for Ingham's Free Range Tenderloins but if you prefer the scrawny Witch look, the chipees are just perfect!! Another cute idea to make meal time fun! 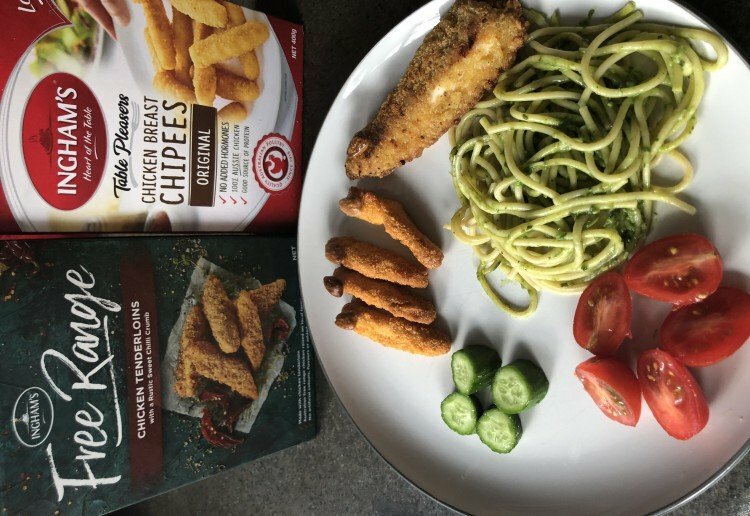 The kids love pesto and crumbed chicken so a winner all around. What would look really funny if you actually used the Ghoulish green pesto hair spaghetti on top of your hair as a wig and when you get hungry you can just eat your hair. my boys will love this, anything with “juicy cumber” is a winner! cant wait to get halloween cooking! Thank your for the ideas, great for an after Halloween walk and before the treats are eaten. This is a fun Halloween recipe – sure to delight! Also; this fun dish will give a little bit of balance to Halloween night – savoury and sweet.